Today after Mass my friend Lizzie and I went to Amvets. And I scored a wonderful find! You know me and religious cookbooks. Ha, ha! Reading back on that post I started laughing because I had completely forgotten about that episode involving me, Brother Victor-Antoine D'Avila-Latourrette and the apple flan that baked for two hours. Hahahahaha! This is why it is important to keep a Web log. Brother Victor-Antoine was also the author of the terrific Monastery Salads cookbook I found at Goodwill. But anyway. Today at Amvets after finding a great hippie maxi-skirt from India, I cruised past the cookbook section. Which was one shelf, with about 10 cookbooks. 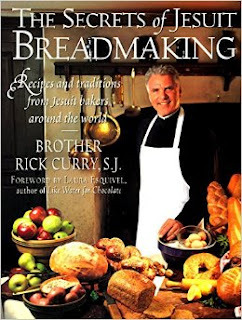 And let me tell you this, one of those ten cookbooks was "The Secrets of Jesuit Breadmaking." I LOVE this book! That is it pictured above. I borrowed it once from the library and loved the Whole Wheat Bread and Cracked Wheat Bread. And I also loved the writing. This author's name is peanuts next to Brother Victor-Antoine. It is Brother Rick Curry, S.J. But he can sure write and he sure can cook too. Subsequent to borrowing that book I picked up another book of his, "The Secrets of Jesuit Soup Making." But I never forgot this bread book. I kept thinking of ordering it. Flush with success I ambled through the record section. No Pennario however I did score a fine Earl Wild record. America's great pianists, you can find them out there if you look. You do have to strike it lucky ... but I did. A wonderful Sunday! And now I am off to the kitchen to do some Jesuit bread making. Perhaps I should invite Pope Francis over. He is a Jesuit too. We must break bread together! Thanks for writing this article on bread-making. I am not a cook, baker, or any of the above, but the cover of this book is lovely, and maybe I'll learn to make breads, cookies, etc. using this as a guide. p.s. I enjoy reading your blog and learning about Leonard Pennario. Kathleen, so sweet of you! You should definitely try baking bread. Everyone who tries it loves it. This book in particular has a nice introduction confronting people's fears about baking bread, worries that the dough won't rise, etc. And he shares all these stories about his life as a Jesuit, and the people he has met, and things that he has learned. Hippie vegetarian cookbooks are also often good intros to bread baking. "The Enchanted Broccoli Forest" by Mollie Katzen and "Laurel's Kitchen" are great. Give it a try out there in Orchard Park and let me know how you do!